Andhra Pradesh ... government-opposition initiatives continue to go on.TDP is fighting against the central government that has given the state funds and special status...Opposition YCP ..The Chief Minister has landed for the initiation of bending.The anti-fraudulent initiative of the CPI (M) in protest against the fraudulent attitude of the central and state governments over status.Initiation camp at Women's Junior College Near Greater Visakha Municipal Corporation. 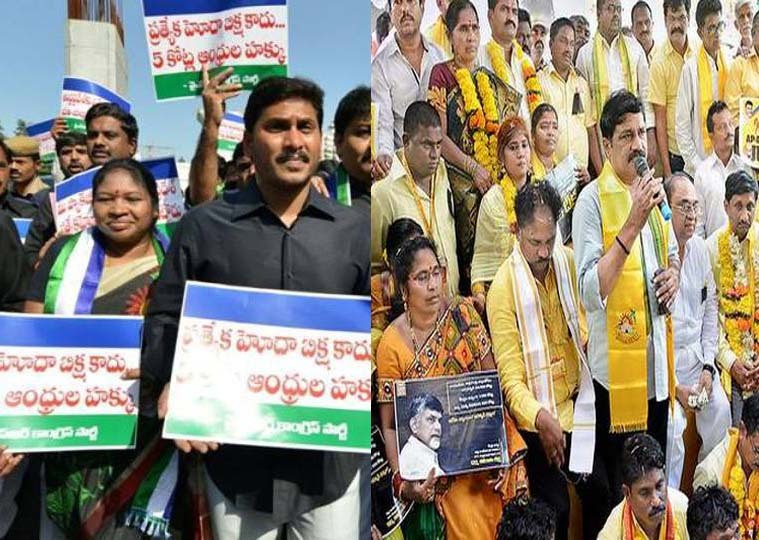 YCP MPs, MLAs and leaders participated in the Initiation.Along with the five MPs who resigned to the post, party MLAs, MLCs and activists participated in protest rallies in protest of the central and state governments. Jagan's footsteps will reach Visakhapatnam district in a few days. The YCP plans to extend local party programs. To this end, the initiative has taken place as a venue for taking party fight across the state. Rajya Sabha members Vijayasai Reddy inspected the arrangements himself. Leaders explained to the people during this initiative as they had fought for the status quo for the status quo and the status quo for the state. The YCP leadership explained that it was the first to fight the special status. According to Jagan's party chief Jagan, the special status element is alive. The Vice-Leaders are clear that the state is capable of providing special status to the state. Chief Minister Chandrababu conveyed to the people that they are trying to get the status of 25 MPs. The Vice-Chairpersons have not complained about the state and state governments in terms of status and division guarantees. The people of the state, along with the Opposition for special status, are silent in the fight for four years and Chandra Babu now criticizes the 'dharma fight' for the sake of initiation in Tirupati. YSRCP leaders have said that they will fight for the benefit of the people of the state and to fight for the implementation of every assurance given by the Center.